Why is breast cancer 'pink'? Home / Health / Why is breast cancer ‘pink’? Why is breast cancer ‘pink’? 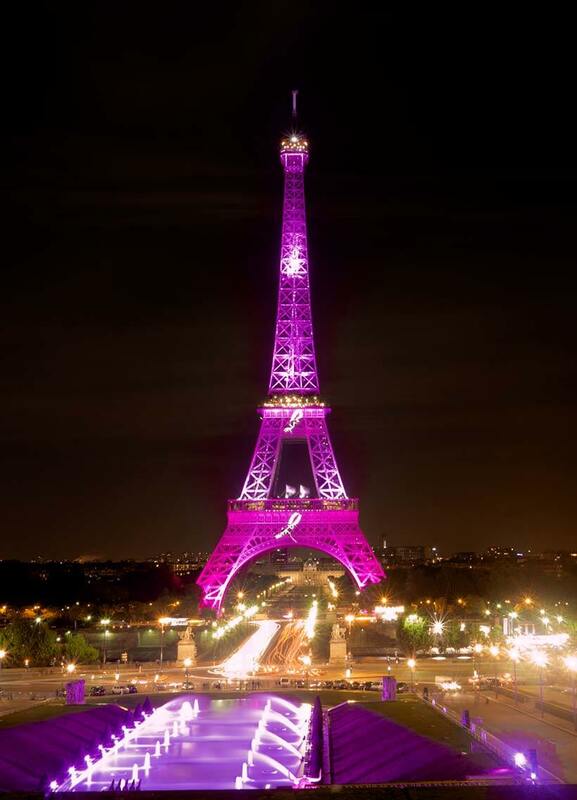 This month, the world glows pink with the “light of hope” that was first lit by Evelyn Lauder 12 years ago. New landmarks such as Dubai’s Burj al Arab and China’s Nanpu Bridge join established stalwarts like New York’s Empire State Building and Belgium’s Amsterdam Bridge to remind women about the need for annual breast cancer checkups, thereby saving millions of lives across the globe. But why pink? And while we are at it, why is breast cancer denoted by a ribbon? Rather than, say, a white flag? Where did the pink ribbon come from, where is it going, and what has it meant along the way? Back in the 19th century, when the US Cavalry Soldiers traditionally wore a yellow scarf around their neck, one would see whole villages of women tying yellow ribbons in their hair to signify their devotion to a sweetheart away at war. There was even a traditional folk song that went ‘Round Her Neck She Wears a Yeller Ribbon. Nobody knows its origins but it has existed in various versions for almost 400 years now. It reached the zenith in the 1973’s Tie a Yellow Ribbon Round the Ole Oak Tree by Irwin Levine and L. Russell Brown, written at the end of the Vietnam War. Then came 1979, the year that Penney Laingen, wife of a hostage in Iran, was inspired by the song to tie yellow ribbons around trees in her front yard. Millions of yellow ribbons sprouted up across the country in solidarity. So, the ribbon became bright red – “because it’s the colour of passion” – and was sent on the Tony awards stage, prominently pinned to the chest of actor Jeremy Irons. Almost overnight, every charitable cause had to have one. In fact, they quickly became so ubiquitous that The New York Times declared 1992 “The Year of the Ribbon”. The stage was set for the breast cancer ribbon. The very first breast cancer ribbon was actually not pink. It was peach. And it was the brainchild of Charlotte Haley, the granddaughter, sister, and mother of women who had battled breast cancer (the disease is often genetic). These peach-coloured loops were handmade in her dining room and handed out along with a card asking women to campaign for higher breast cancer funding. In the meantime, the Susan G. Komen Breast Cancer Foundation had been handing out bright pink visors to breast cancer survivors running in its ‘Race for the Cure’ since 1990. These were, however, just mere stepping stones. To really reach its true potential, there had to be some unanimous symbol for breast cancer worldwide. And then there needed to be a situation in which this symbol was the event. The situation came soon enough. 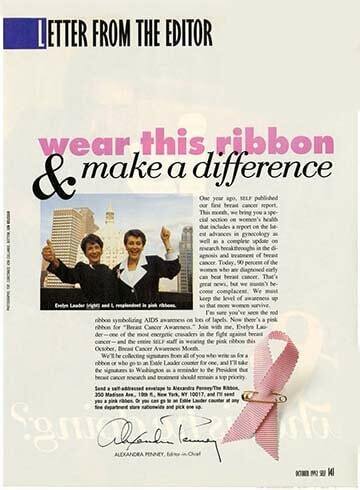 In 1992, Alexandra Penney, Editor-in-Chief of Self, had an inspiration while designing the magazine’s annual Breast Cancer Awareness Month issue: Create a ribbon and enlist Estée Lauder, the cosmetics giant that had fronted previous breast cancer initiatives, to distribute it in New York City stores. Breast cancer survivor Evelyn Lauder, daughter-in-law of Estée Lauder, went one better: She promised to put the ribbon on cosmetics counters across the country. So, they chose pink. Almost randomly. Because, sometimes, semiotic symbols are born simply by chance. Or accident. In the Fall of 1992, Estée Lauder handed out 1.5 million ribbons, each accompanied by a card describing a proper breast self-exam. They also collected over 200,000 pink ribbon petitions urging the government to push for increased funding for research. The pink ribbon had arrived. 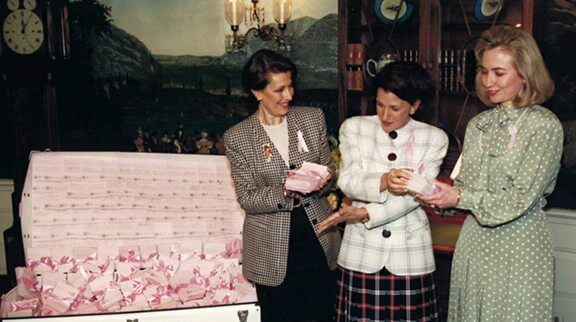 In 1993, Pink Ribbon petitions were delivered by Evelyn Lauder and Alexandra Penney to First Lady Hillary Clinton at The White House, urging government support for breast cancer awareness. Subsequently, President Bill Clinton signed a proclamation naming October 19th as ‘National Mammography Day’. Then Avon jumped into the fold. About two inches long, the original Avon pink ribbon (issued in 1993) was a formidable piece of jewellery – half pink enamel and half gold cast, with a golden rose in the middle. In it’s first two years, the pin raised US$10 million. Later that year, Estée Lauder introduced a heart-shaped compact with an enameled pink ribbon design, whose profits would go to its Breast Cancer Research Fund. The Susan G. Komen Foundation started offering a pink rhinestone brooch. Carolee Jewelry created one with a female runner in midstride, flowing ribbon in hand. Teddy bears, sports clothes, credit cards, bed linen, perfumes… name it and there was a version of the original Estée Lauder pink ribbon to match! Between 1991 and 1996, federal funding for breast cancer research increased nearly fourfold to over $550 million. And after increasing for more than two decades, breast cancer incidence rates began dropping from 2002 onwards. That’s not all: According to the American Cancer Society, the percentage of women getting annual mammograms and clinical breast exams has more than doubled. Most importantly, it wasn’t just in the USA – the movement was worldwide and so were the results. And while the pink ribbon was essentially an Estée Lauder creation, the company had no qualms about letting it be used by thousands of brands worldwide to create products that would increase awareness about breast cancer and bring in money for the cause. Because that, after all, is the only thing that matters. In 1996, the pink and blue ribbon was designed by Nancy Nick, president and founder of the John W. Nick Foundation to bring awareness that “Men Get Breast Cancer Too!”. 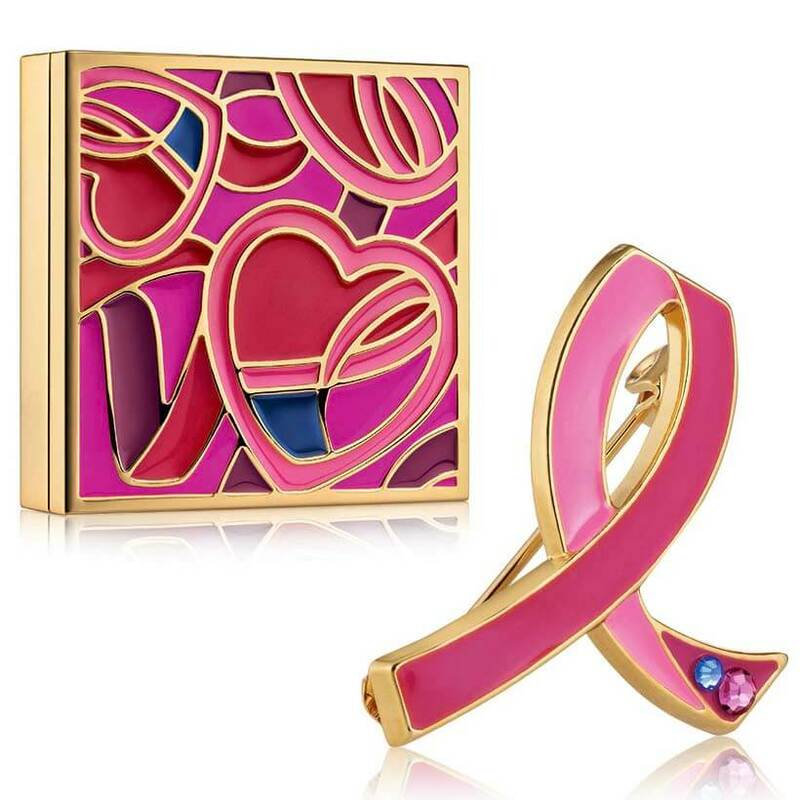 Later, a blue stone was added to the Estée Lauder Jeweled Pink Ribbon Pin to represent the 1% of all breast cancer cases that are diagnosed in men. By the year 2000, Evelyn Lauder knew that someone had to start going further than pink ribbons. So, she launched the Global Landmark Illuminations Initiative to focus further attention on the importance of breast health and early detection. In its first year, 26 landmarks in 22 countries were lit in bright pink lights, including New York’s Empire State Building, Sydney’s Opera House and Italy’s Tower of Pisa. To date, over over 600 landmarks have been illuminated across 70 countries, including Esterházy Castle (Austria), Niagara Falls (Canada), Zappeion (Greece), Taj Mahal Palace Hotel (India) and The Peninsula Hotel (Hong Kong). And even though a few detractors question the effectiveness of this campaign, the fact remains that Estée Lauder has managed to link the colour pink with breast cancer so effectively that worldwide, when you see a pink-hued building looming on the horizon, it makes you pause. And think. And maybe take that life saving mammography test. And that, in the truest sense is the achievement of ‘pink’, and the women who brought this lethal disease – which affects everyone, yet was spoken about by none due to social and cultural constraints – into the global limelight. With every single woman (or man) who defeats breast cancer, the campaign gains a victory. 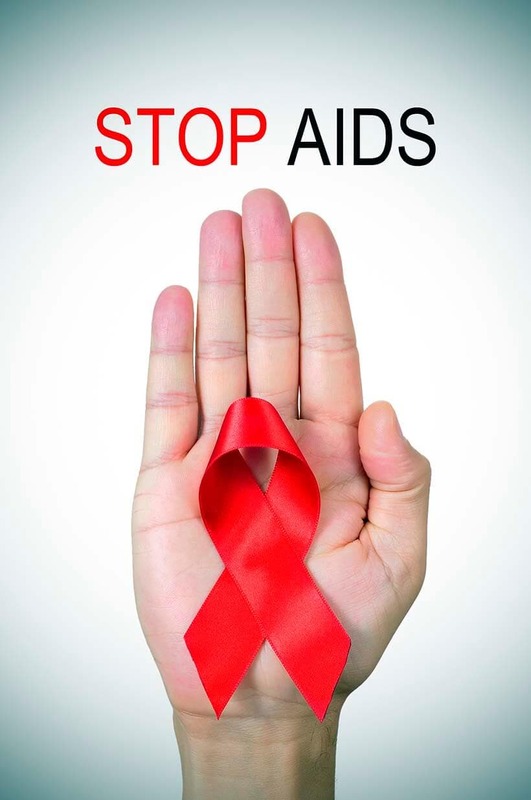 So, go and visit the part of your city that has become a beacon for this glowing cause. Pause for a minute and think of all those who have gone before. And then take that test. TODAY. Will you? Thanx 🙂 It’s something I have wondered about quite often! Thank u 🙂 There was so much surprising stuff out there! The pink ribbon supports Chemotherapy and Radiation so as a breast cancer survivor myself I don’t believe in it. If you properly knew about Charlotte Haley, you would understand and know that “Charlotte Hayley was trying to make a statement to the NCI after her mother, sister and daughter had all been diagnosed with breast cancer. She came from her heart and was sincere about creating awareness about the Prevention of Breast Cancer. Estee lauder loved Charlotte’s idea of the ribbon and wanted to join forces with her to raise money for breast cancer, while promoting her toxic perfumes and skin products. Well, Charlotte quickly saw where this was headed and refused her offer. Estee Lauder stole the ribbon idea and changed the color to pink.”- Dr. Veronique Desaulniers. Few women question, or have questioned, what’s really behind the pink ribbon movement, war on cancer and the endless calls for breast cancer awareness. Most people would be much smarter and better informed if they had awareness of what this movement or the war on cancer do NOT raise awareness about. Knowing that the most prominent cancer charities (Komen, American Cancer Society, etc) are large self-serving businesses instead of “charities” or that these groups suppress critical information on cancer, such as the known causes of cancer (instead they talk about “risk factors” of cancer) or that many “breast cancer survivors” are victims of harm instead of receivers of benefit, or that they’ve been intentionally misleading the ignorant public with deceptive cancer survival statistics, or that government health bodies such as the NIH are merely a pawns for corporate medicine, etc is a good start to get to the real truth (read this well referenced scholarly article’s afterword on the war on cancer: do a search engine query for “A Mammogram Letter The British Medical Journal Censored” by a published author of the Orthomolecular Medicine News organization, and scroll down to the afterword that addresses the phony ‘war on cancer’). The recognition that breast cancer awareness was started by these business interests is another piece of the real awareness about the pink ribbon cult and the traditional war on cancer. Or that the orthodox cancer business has been denouncing, suppressing and squashing a number of very effective and beneficial alternative cancer approaches (instead they sold you the lie that only their highly profitable/expensive, toxic conventional cancer treatments are relevant). You probably guessed why: effective, safe, inexpensive cancer therapies are cutting into the astronomical profits of the medical mafia’s lucrative treatments. That longstanding decadent activity is part of the fraud of the war on cancer. So, raising “awareness” about breast cancer or raising funds for the war on cancer have hardly any other function than to drive more unsuspecting people into getting more expensive and unnecessary tests (think mammography) and then, often, cancer treatments (chemo and radiation therapy). The reality is that the war on cancer has been and still is, by and large, a complete failure (read Dr. Guy Faguet’s ‘War on cancer,” Dr. Sam Epstein’s work, or Clifton Leaf’s book on this bogus ‘war’). Since the war on cancer began orthodox medicine hasn’t progressed in their basic highly profitable therapies: it still uses only highly toxic, deadly things like radiation, chemo, surgery, and drugs that have killed millions of people instead of the disease. As long as the official “war on cancer” is a HUGE BUSINESS based on expensive TREATMENTS/INTERVENTIONS of a disease instead of its PREVENTION, logically, they will never find a cure for cancer. The upcoming moonshot-war on cancer inventions, too, will include industry-profitable gene therapies of cancer treatment that are right in line with the erroneous working model of mechanistic reductionism of allopathic medicine. The lucrative game of the medical business is to endlessly “look for” a cure but not “find” a cure. Practically all resources in the phony ‘war on cancer’ are poured into treating cancer but almost none in the prevention of the disease. It’s proof positive that big money and a total lack of ethics rule the official medical establishment. The history of the pink ribbon movement and the alleged war on cancer is fraught by corruption, propaganda, and the hoodwinking of the unsuspecting public. The entire war on cancer is a disinformation campaign. The real war is on the unsuspecting public. Does anyone really think it’s a coincidence that double Nobel laureate Linus Pauling called the ‘war on cancer’ a fraud? If you look closer you’ll come to the same conclusion. But…politics and self-serving interests of the conventional medical cartel, and their allied corporate media (the mainstream fake news media), keep the real truth far away from the public at large. Or people’s own denial of the real truth.